Read Me or Expect to be Disappointed! You must be reading this on your mobile device or Android tablet or this will not work. The link below will connect you directly to the Nightscout uploader application. After completing the download you will generally need to swipe down from the top of the screen on your device to find the Nightscout.APK file. When you tap it, your Android phone will show you a warning regarding the installation of software from unknown locations. You will have to accept that warning and OK the installation to move forward. Nightscout is community-based code for educational purposes. Nightscout is subject to down periods, instability, and software defects. You are responsible for the creation of the full Nightscout setup. There is no warranty given or implied with the use of Nightscout and related softwares. You are doing this ENTIRELY AT YOUR OWN RISK. 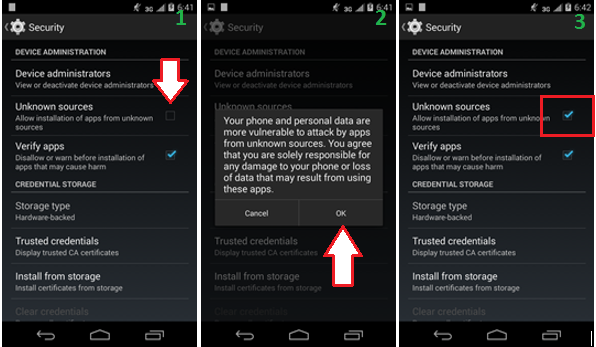 Step 1: Turn off the setting that prevents downloads from unknown sources ON YOUR PHONE. Touch the box to turn it on. Select OK when the warning message appears. Note: you can turn this off after you have completed the installation of the uploader app. If the app does not auto-install, swipe down from the top left of the home screen and tap on the Nightscout download to complete the installation. Click here to return to the main installation page and resume. We are so thankful for all your hard work! We have two young T1Ds. God Bless! Im extremely greatful this is available to enable our kids to lead as normal a life as any other child would. Thanks for the step by step instructions. It freaked me out at first but I seem to be able to figure it out. Double thumbs up.